Welcome to our team, Paul! Hi there all Mobiversal aficionados! Today we want to introduce you our newest colleague! 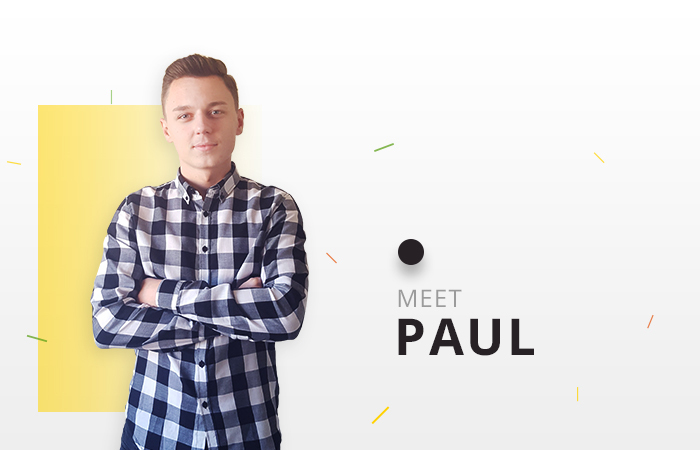 Paul Tiriteu started a new journey in his career as an iOS developer here at Mobiversal headquarters and we have prepared a short interview with him. A: A warm welcome Paul into the Mobi team! P: Glad to be here Alex! Thank you for having me! A: Paul, tell us briefly something about yourself. P: Well, first of all, my name is Paul Tiriteu. I live in Oradea and I am currently in my last year of study in the Computer Science and Electrical Engineering program. My passion for computers comes from a very young age when I recall playing video games at the age of 12. I can say that the only activities that occupied my time in the spare days were computing games and swimming! I have left behind swimming, but my first passion for Computer Science remained one of my main hobbies. A: Can you tell us about your decision in applying to the Computer Science and Electrical Engineering program? P: Yes! In the 10th grade, I was involved in a student exchange term in Finland where I met a professor that is now teaching in the Computer Science program. We rapidly connected, became friends, and he introduced me to some of his projects. After the experience was over, he invited me to take part at his seminars where he taught within the Faculty. I have to say I really enjoyed it and since then I continued growing in this field. A: How did you come across Mobiversal and what encouraged you to apply for a position? P: Honestly, one of Mobiversals former employee told me about the company. I knew about Mobiversal even before I started my college years, that being 2015. What was more interesting is that right after I started my studies, I found out that I already had one colleague that was working there and afterward I heard about others that also found a job there! Of course, I wanted to join! I had the chance to be invited to an interview with the CTO and the Project Manager and be tested in a programming language at my own choice. What followed is that I was called in by the CEO and told me I was hired! In my first day at work, all of the team came to greet me and they helped me with everything I needed. I really felt welcomed and I can say the organizational culture is a great one! A: Now you are working as an iOS developer. As you know, Mobiversal provides services for various clients but is also building our own products. What do you think are five qualities a developer needs to make it in the company? P: Well, first of all, I want to stress out how important it is to be passionate. I see it this way: with passion comes also the will to learn and the motivation to persevere when the going on gets hard. I value most the capacity to learn new things and to adapt to new situations than the experience itself. A: What inspires you most? P: In the last couples of years technology developed increasingly and I think that the people who will have the skills to perform in this field and can develop new products will have a bright future. A: Mobiversal has a rich organizational culture in which we take pride. What are your expectations related to your new teammates? P: The environment is really nice in the company and my colleagues I can see they are very smart. You can talk about anything with them. I also noticed the good management process in with they nurture their employees and I am strongly convinced that I will have a lot of opportunities to grow in this company. A: And now for the last question! What are your plans for the future and where would you see yourself in five years? P: That’s easy! In five years I visualize myself launching my own mobile app and most probably I will still be a part of Mobiversal but working at a higher level. A: Thank you, Paul, for your time! I wish you the best of luck in this new journey at Mobiversal! P: Thank you for having me!